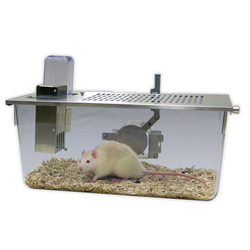 This Voluntary Running Wheel for rats may be used as a stand-alone unit for short term measurements or with the optional Living Chamber for long-term circadian rhythm and general activity studies. 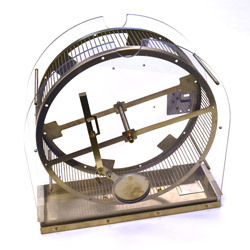 This Scurry voluntary running wheel with living chamber was designed for long term circadian rhythm and general activity studies in rats or similar sized animals. This clear polycarbonate living chamber attaches to the activity wheel via a SS tunnel. 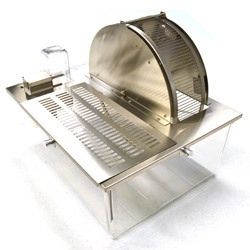 Guillotine doors on the wheel and chamber may be used to restrict animal movement and prevent accidental escape. 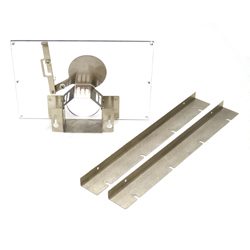 This kit connects any Model 80805 Rat Activity Wheel to any Model 80004 Modular Test Chamber. 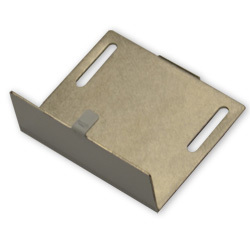 A simple screw on stainless steel bracket that manually locks the wheel in place.